Toyota Rent a Car is a vehicle rental system available only through Toyota dealers. Toyota Rent a Car was designed to assist dealers in offering quality, temporary transportation for their customers. Whether you need a service rental, an insurance replacement vehicle, leisure rental, or travel for business. Toyota has you covered. Yes. We are able to provide very competitive rates on all of our rental vehicles. In fact, we often are able to beat the competition and provide you with a better value. With the exception of customers that are flying out of the Bozeman International Airport, all vehicles must be returned to our rental office. We have a wide variety of the latest models available for rent, including trucks and Hybrids. Models are subject to availability. 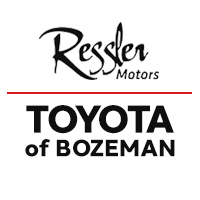 Do you only offer Toyota Rental Vehicles?Because Ressler Motors is a Chevrolet and Cadillac dealer in addition to Toyota we offer a selection of GM vehicles in order to better meet the unique needs of our customers. While we primarily rent Toyota products, we may have a similar GM vehicle to meet your reservation when you pick up your rental. All rentals are late model vehicles, and are well maintained. Can I smoke in the rental vehicle? No, our rental fleet is 100% non-smoking. Customers that choose to smoke in the vehicle will be charged a $250 detail fee. Absolutely. Most Toyota Rent a Car vehicles are available to purchase after a short in-service period. Please check with our rental department for more details. Toyota Rent a Car vehicles are allowed in the continental United States, Alaska and Canada. Toyota Rent a Car vehicles are not permitted in Mexico. Please contact us at 406-585-2010 for details on mileage restrictions. Yes. You must be at least 21 years of age to rent a vehicle. All drivers must be included on the rental agreement with the exception of the renter’s spouse. Additional drivers can be added to the rental agreement assuming they meet all the same qualifications as the renter. Any additional driver must be present at our office in order to be added to the contract. We cannot add an additional driver with a copy of a drivers license, fax, or email. You need a valid driver’s license, credit or debit card in your own name, and full coverage insurance with comprehensive and collision coverage in order to rent a vehicle. Can I use a pre-paid card, check or cash? At the time of rental all estimated charges will be authorized on a major credit card or charged on a debit card. The card used must be in the name of the person renting and signing for the rental car. We are unable to use a pre-paid debit card, gift card, cash or check when your rent the vehicle. You may however use a pre-paid card, or cash as final payment when you return the vehicle. Do you offer Collision Damage Waiver (CDW)? At this time we do not offer any Collision Damage Waiver or supplemental insurance. We require that you provide your own full coverage insurance including liability, comprehensive, and collision coverage that transfers to a rental vehicle. Rental coverage on a credit card or travel insurance is not a sufficient coverage to rent a car with us, but may be a great supplement beyond what is required when renting. Absolutely! We can pick you up from the airport Monday to Friday from 8:00am to 4:00pm, and Saturday from 9:00am to 2:00pm. Please be aware that the airport does charge an extra 10% fee to your rental anytime we go onto their property. Most of the time this will be cheaper than taking a taxi as a $40 fare is not uncommon for a taxi in Bozeman. Incoming flight information is required for all airport pickups. Do you have special rates for businesses? Yes! We have a special rental program designed for business that rent frequently. Please contact us for detail on this program. Some states will hold a Driver’s License after a ticket has been issued by police. This ticket is not acceptable.